What's the best camera backpack tripod holder system? 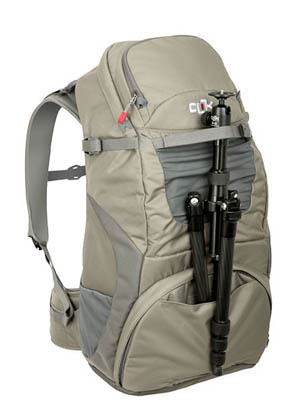 You have several options if you want to attach your camera tripod to your backpack. This article will help you decide on the right system for your tripod and backpack. If you already have a tripod keep on reading. If you're also looking for a tripod good for travel, click this post to consider the best tripod for travel. With smaller, compact tripods you have more options and they are easier to attach and carry. 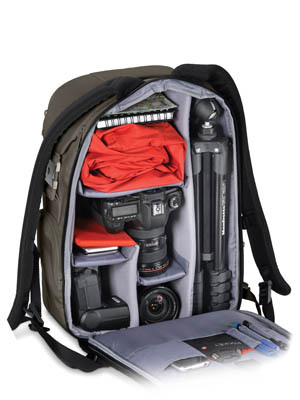 There are even a few camera backpacks that let you store your tripod inside the backpack. That's a great feature if you're looking for the best camera backpack for travel. You can keep your tripod protected from theft and damage at the same time. There are 3 main qualities you will want to have when securing your tripod to your camera backpack. 1. A minimum of two contact points. The majority of tripod holders have a pouch or pocket at the bottom and a strap at the top. 2. Centered. 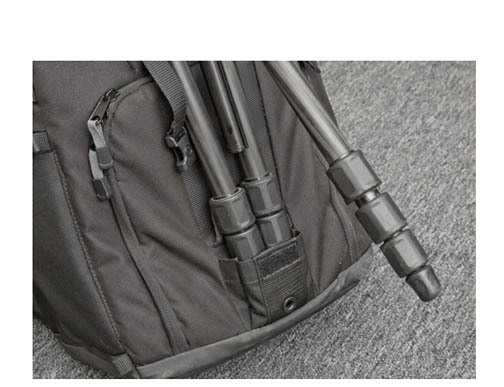 Having a side-mounted backpack tripod holder can create a lopsided tilt to your camera bag. Worse yet, it could give you a sore back from leaning to one side on a long hike. If your backpack is heavy and your tripod is real light this is not as big of a factor. 3. Pouches. The pouch or pocket at the bottom should hold at least two of your tripod's legs. Some backpacks have hidden pockets that you can pull out only when you want to attach your tripod. Others have a cinch strap to secure your third tripod leg. Straps that cinch, not elastic straps. Before I purchased my Tamrac backpack I once tried using bungee cords to hold my tripod to my bag. Bad idea. My tripod was wiggling and bouncing like a breakdancer on steroids. 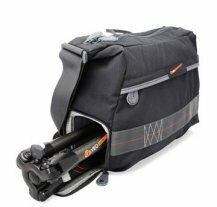 Pouches that are deep enough and wide enough to hold two tripod legs. That cuts down on rotational movement. Some pouches will even hold all three legs. 1. Carry your tripod inside your backpack. 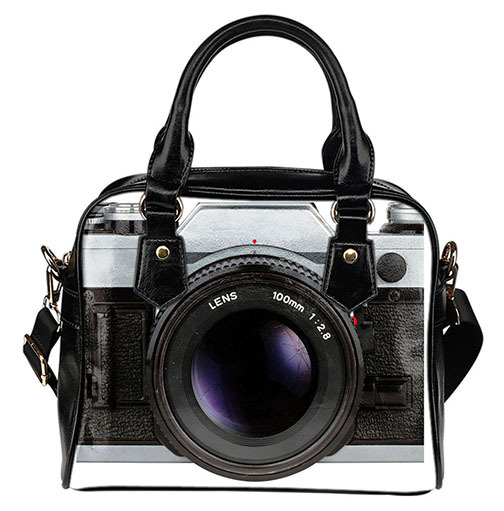 This shoulder camera bag by Vanguard has a tripod compartment built in. 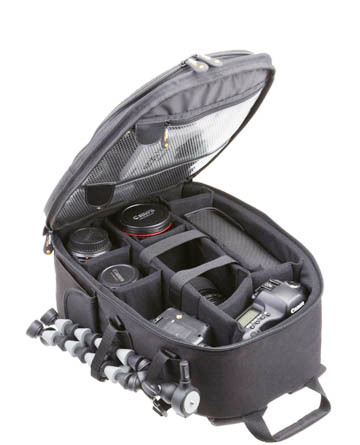 Taller camera backpacks can be configured to keep you tripod in the main compartment too. This means you have less room for cameras, lenses, and accessories. If you normally keep you equipment list short, this may be a great plan for you. 2. Carry your tripod with its own strap. I do this for transporting my gear from my van into my clients homes for portrait photography jobs. I don't do this for backpacking and hiking.My portrait tripod is too heavy and too long for carrying on my backpack. 3. You can carry the tripod underneath or on top if you prefer shoulder camera bags. This is great for short distances but not for long-range treks. 4. Use Velcro strips. Find a loop and a handle on your camera backpack and you might be able to finagle a temporary tripod-carrying fix. Velcro strips have weight limitations and do wear out over time. 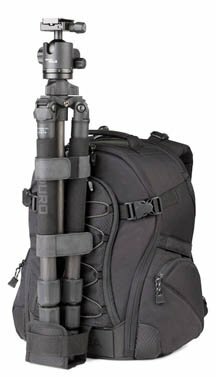 The best camera backpacks that carry tripods have to be the right size to carry your other camera equipment and personal belongings. Start by looking at your collection of cameras, lenses, and accessories that you are going to want to fit inside your backpack. Next add your list of any personal belongings, food, clothing, etc. that you want to include. Then look at your tripod and how the camera backpack will hold it. 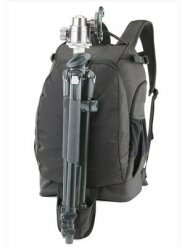 This Tamrac backpack has 4 points of contact to hold your tripod; a pouch for two legs and 3 cinch straps. It's good for small tripods. It's a short, stubby backpack and your tripod should be compact too for a good fit. It has a lot of features for a bag at this price point. I like the airflow system to keep yourself cool. You get plenty of places for storing small accessories. Watching this video will definitely help you see the features and benefits that can come with a good tripod-carrying camera bag. It shows the Tamrac 5586. Pay attention the specific model number when you are evaluating tripod model numbers. Manufacturers make changes frequently. 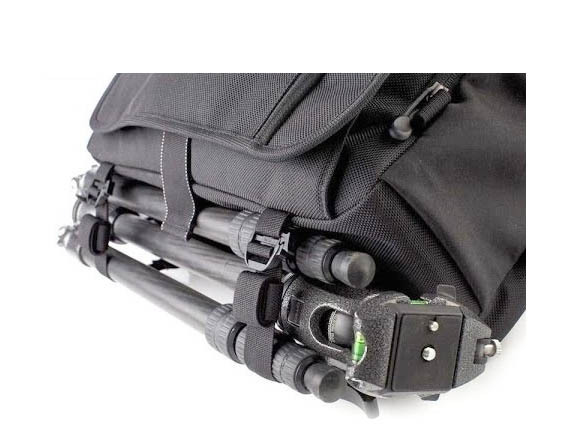 This backpack can hold a small tripod on the side. It has padded shoulder straps, chest strap, and waist strap. You get plenty of sealable pockets for accessories. It's the most affordable option. It's about 12 x 15 x 7 inches. This backpack is so much cheaper than the others you might wonder why. The materials are not quite the same quality as you get with a backpack made by one of the pro bag makers, like Tenba, Lowepro, or Tamrac. With that said, you shouldn't just dismiss the Amazon as a possible best choice for your equipment. If you don't overstuff it and treat it gently, it could perform just fine for you. You could buy 3 of the Amazon basic camera backpacks for less than the Tamrac 5585 Expedition. I ended up getting a Tamrac 5789 Evolution 9 Sling backpack. They've since been discontinued, but Tamrac updated this model with a few changes to its design and they new model is called Corona. 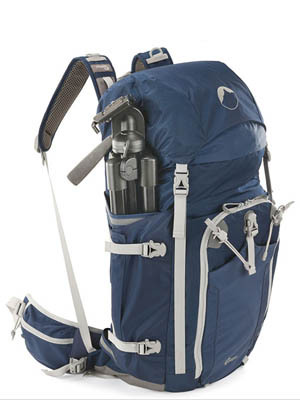 I don't like the changes at all and I can't recommend the Corona as a substitute for the 5789 Evolution backpack. There are some backpacks that are rated a little higher, but this bag had exactly what I wanted. It's good for up to about 20 lbs. I was looking to stow camera equipment as well as hiking supplies and this was the right size. It was the best camera backpack for hiking and that was the biggest determining point for me. I spent weeks reading reviews on Amazon and thinking about exactly what cameras, lenses, and accessories I was going to tote along on my photography excursions. I wanted a medium sized sling bag where I could access gear without setting it down. I sometimes shoot in wet areas or on uneven terrain. I use it with my Rocketfish carbon fiber tripod and it attaches securely with no major issues. The pocket for the two tripod's legs is small, but with the tripod I use, it fits nicely. I was real specific in my needs for my next camera bag. I already have 3 shoulder camera bags and a high end airline travel bag made by ThinkTankPhoto. 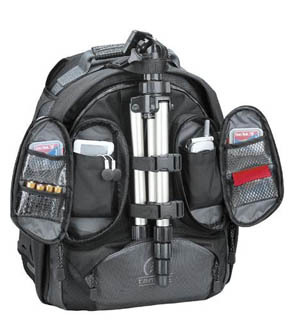 Camera backpack with tripod holders come in a huge variety of sizes and designs. I hope this helped you learn at least a little bit to help you with whatever you're working on. 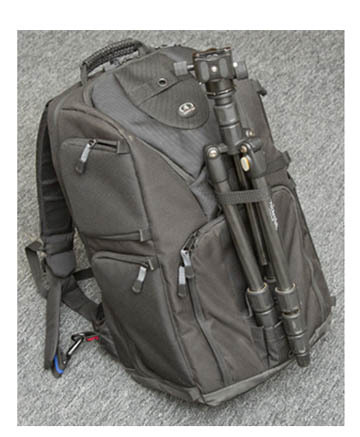 You can find more helpful ideas by reading reviews of other buyers who have their own unique experience with camera backpacks that hold tripods. Here is the link to search reviews of any product you want information on, including the best camera backpack tripod that fits YOUR NEEDS.